Feel the real extreme driving an incredible motorcycle. Cross motorcycle addon adds 10 cross bikes which were made in different colors. These bikes look realistic and can accommodate only one player. Jeeps mod is an analogue of this addon and has the same features, except you get a jeep. There motorcyclist suit to look like a real rider. Wear it and sit on the bike, then acceleration to maximum speed and jump from any cliffs. To get any of these bikes take spiders spawn eggs (spiders replace bikes). Bright headlights shines very well in the dark, so you will never lose your friend at night. Download the archive and select a favorite color. Activate the behavior file and the selected color. 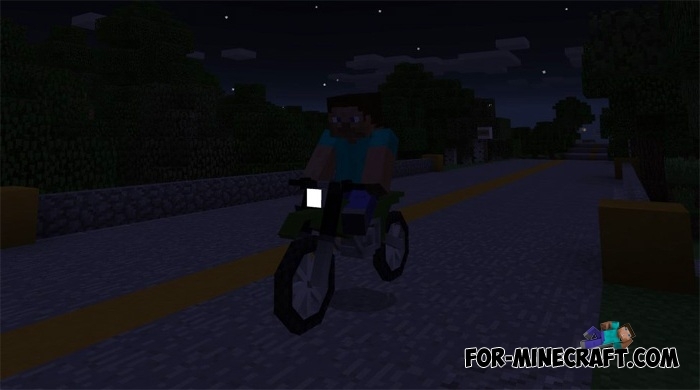 Tron Bike mod for MCPE 0.14.0Tron Bike mod adds vehicles from "Tron" movie universe in Minecraft PE 0.14, known as - light cycle.